Inhalers are not the enemy; they are life-saving tools that you should always use if or when these tools don't bring immediate & satisfactory relief. Remember, your inhaler can save your life. Use it if you need it! As a sufferer of adult-onset asthma I know what it's like to be faced with the terrifying moment of not being able to breath. If you don't have inhalers, you can learn some amazing tools to stop an asthma attack without an inhaler follow 5 powerful ways. Sit down. Too simple? No. It's crucial. It's much easier to breathe sitting than any other position. Sit down and stay seated until your breath is fully back under your control. The dishes will wait. Your schedule will wait. Your "to-do list" will wait. Think about it. If you're not around to do your dishes, your schedule or your "to-do list" then there's no point. Sit and stay seated. Breathing is much easier. Drink some more clean, un-carbonated water. Your lungs run on water to pump air. That's right. Not enough water means not enough pumping of air. The water needs to be clean, flat (un-carbonated) with nothing else in it. Tea doesn't count, nor coffee, nor soup. Just water. Part of the reason you have asthma is due to a shortage of clean water in your system. Time to fill up! Put a small pinch of salt on your tongue after two glasses of water and let it dissolve on your tongue. This strange recipe can be miraculous. The order is crucial. First drink two full (tall) glasses of water and then follow that with a small pinch of salt on the tongue. Think of it as salty candy and just let it dissolve. The ideal is good quality sea salt--but any salt will work. It can be a life-saving recipe for you. Hold your middle finger while you're sitting down. Take your hand and wrap all the fingers around the middle (longest) finger of the other hand. No, it's not a "pull my finger" joke (though it may look like it!). It's a powerful energetic Mudra (secret hand-clasping technique for healing) that is thousands of years old and quite amazing. It doesn't matter whether you hold onto your left or right middle finger, just wrap all the fingers of one hand around the opposite middle finger and hold gently. No pulling, rubbing, squeezing or massaging is required. Just hold. Hold it until your breath FULLY normalizes. Sometimes that's 30 seconds, sometimes 4 to 6 minutes and sometimes (for folks like myself who managed to never use an inhaler - NOT something I recommend!) it's hours. Find out for yourself how reliable and powerful this is. Do something SIMPLE with your terrified mind to pull down your anxiety. Not so easy. However, it's possible to use something so simple that your anxiety WILL drop. The simplest is to put your attention on objects in the room or place you find yourself in and trace curved lines with your eyes. What? Look for objects in your environment that have curved edges (not straight lines) and trace those curves with your eyes. Good objects like lamps, vases and rounded table corners are everywhere. If that's too stressful to find, just imagine circles, spheres and curved lines in the air in front of you and trace those with your eyes. You'll be amazed at how this neurological "trick" pulls down anxious thoughts. Remember, your inhaler can save your life. Wait until your FULL breath is FULLY under your control before you slowly return to your life. 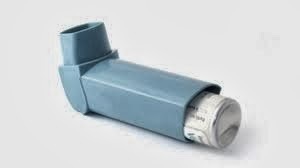 Remember, your inhaler can save your life.